Here are the top 10 players in Box-Toppers points (BTP) for the 2019 season through the games of April 15. Player of the Day—Yelich hit three home runs, including two three-run shots, in the 10-7 win over the Cardinals. Yelich went 3-for-4, scoring three times and driving in seven runs. Yelich earns 2.0 Box-Toppers points for being Player of the Day, giving him 3.5 for the season, rising to ninth place in season player rankings, second among National League batters, behind Cody Bellinger of the Dodgers (5.2). Yelich led NL batters in Box-Toppers points in 2018 with 11.5. American League Player of the Day—Indians pitcher Trevor Bauer struck out eight over 6 2/3 innings, allowing one run, five hits and three walks, in the 6-4 win over the Mariners. Bauer earns 1.7 Box-Toppers points for being AL Player of the Day, giving him 5.4 points on the season, rising from sixth to first in season player rankings, passing previous leader Cody Bellinger of the Dodgers (5.2). Bauer also rises to first place among AL pitchers, passing previous leader Blake Snell of the Rays (4.0). American League Batter of the Day—Teoscar Hernandez of the Blue Jays hit an eighth-inning, go-ahead, three-run homer in the 5-3 win over the twins. Hernandez went 3-for-4, scoring once and driving in three runs. National League Batter of the Day—There is no separate NL Batter of the Day for Monday because the overall Player of the Day is NL batter Christian Yelich. Streak—Dodgers pitcher Clayton Kershaw has now earned Box-Toppers points in 12 straight seasons after earning his first Player of the Game honor of 2019 Monday. Kershaw (7IP 5H 2R 0BB 6K ND in the 4-3 win over the Reds) earned his first Box-Toppers points in 2008 with the Dodgers and now has 215.8 career points, third among all players since 1995, when Box-Toppers tracking began. He trails second-ranked player Pedro Martinez (244.8). Kershaw ranks first in career points among active players. Kershaw’s best season was 2014 with the Dodgers when he had 31.5 Box-Toppers points, first among all players. He has led all players in Box-Toppers points in a season three times (2011, 2013 and 2014) and finished among the top three in points in each season from 2011 to 2017. He earned 20 or more points for those seven straight seasons, the longest such streak since Box-Toppers tracking began in 1995. However, in 2018, he earned just 8.0 Box-Toppers points, 73rd among all players. Debut—Dwight Smith Jr. of the Orioles made his Box-Toppers debut Monday with his first career Player of the Game honor. Smith (HR 2B 2-5 R 4BI in the 8-1 win over the Red Sox) made his Major League debut May 18, 2017, and was playing in his 63rd career game. Scoring—Yelich earns 2.0 Box-Toppers points for being Player of the Day and Bauer earns 1.7 points for being AL Player of the Day. Hernandez earns 1.5 points for being AL Batter of the Day. All of Monday’s other Players of the Game (listed in the chart below) earn 1.0 Box-Toppers point. 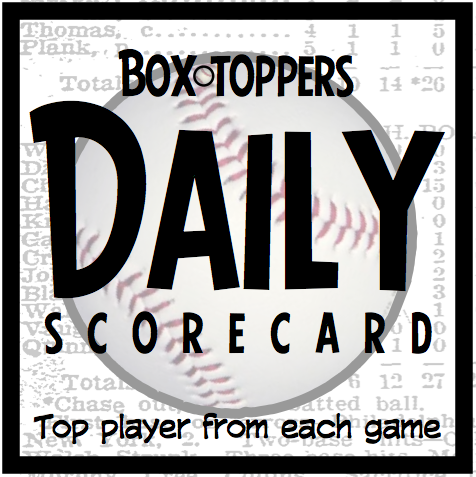 TagsBox-Toppers Daily Scorecard, Christian Yelich, Trevor Bauer, New Box-Toppers points leader, Cody Bellinger, Blake Snell, Teoscar Hernandez, Streak with at least 1.0 Box-Toppers point in a season, Clayton Kershaw, Pedro Martinez, Box-Toppers debut, Dwight Smith Jr.